Share the post "USA Ambassador Donald Beyer visits Les Roches International School of Hotel Management"
Les Roches International School of Hotel Management welcomed Donald Beyer, ambassador of the USA in Switzerland, in Bluche during his official visit to the Valais Canton on Wednesday 20 October 2010. Ambassador Beyer was showed around the beautiful Bluche campus by CEO Arie van der Spek and Campus Director Clive Taylor and had different interesting talks with ‘Les Roches’ students. H.E. Beyer was sworn in as the United States Ambassador in to Switzerland and Lichtenstein in August 2009. In addition to his political career, he is recognized as leader in business in the USA. 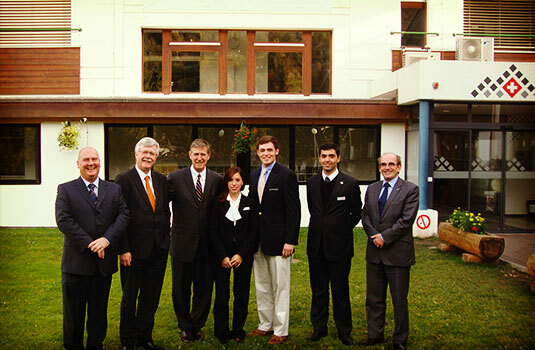 Les Roches International School of Hotel Management CEO Arie van der Spek explained to the US Ambassador the key facts of Les Roches and Laureate Hospitality Education (LHE). After a visit of the Campus, Mr. Beyer had the opportunity to speak with three of the Les Roches students: Myles Holdsworth (USA, BBA), Kyle Borg (Malta, MBA) and Milena Carruzzo (Switzerland, BBA). Photo (from left): Clive Taylor, Arie van der Spek, US Ambassador Donald Beyer, Milena Carruzzo, Myles Holdsworth, Kyle Borg, Jeremy Hutchinson.